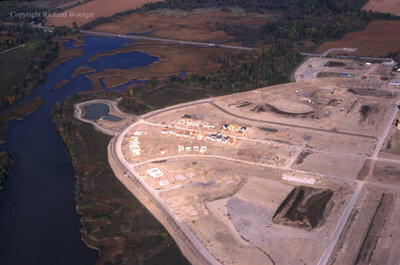 A colour slide of an aerial view of the subdivision of Whitby Shores under construction. Lynde Shores Conservation area is on the left side of the photograph. Victoria Street West can be seen in the background. Aerial View of Whitby Shores, October 7, 1998, Richard Woolger. Whitby Archives A2014_014_024.